Work!!! I’ve been literally itching for new Beyoncé – my life has fallen less fierce each day she is not running the music world. This is a POWER song/anthem for ladies everywhere (as if she didn’t already give us one)! Killer beat. I want to yell this everywhere. Can you even imagine what this video is going to look like? I’m gonna melt of excitement watching it. Word on the blogosphere is that she directed hundreds of dancers for a massive dance scene. She did that! Above is a photo from the set of her new music video – dayum. Listen above and instantly fiercen your day. UPDATE: I just changed the audio to the official CDQ version which is Major Lazer’s “Pon De Floor” track under “Run The World (Girls)”. E.P.I.C. Mystery interview revealed! So who is Tiffany Moníque and why do you care? 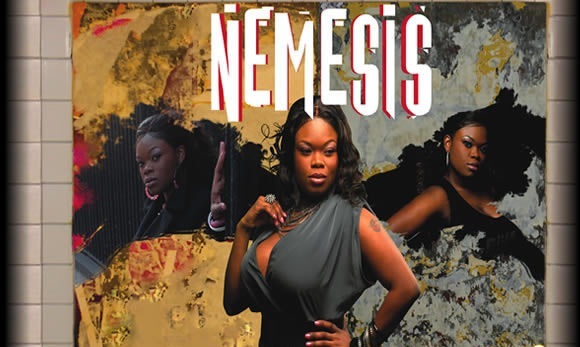 Is she a breakout artist with a new EP out entitled “Nemesis”? Did she just release her music video for her hot new single? Is she one of Beyoncé’s well-known back-up singers known as The Mamas? Tiffany Moníque is all of the above and so much more. Her team emailed me, we set up an interview, and I got to talk to this amazingly talented artist herself. Parked in front of the Home Depot for a half hour, Tiffany chatted with me on the phone about everything from touring with Beyoncé, to her hometown, and guilty pleasures (which is cookies and cream ice cream, by the way. Delish). With a “diverse music personality” ranging from country to classical appreciation, Tiffany has a contagious drive to prove the nonbelievers wrong and build a successful solo career. In fact, her motto is to “live life unapologetically and be true to [her]self, living life to the fullest”. Although she did not come out of the womb singing, she started soon after at age 3 in church. Her first professional work came in her teenage years – “my first real experience was probably around 18 years old when I first went to the recording studio and knew for a fact that I wanted to build a career in music”, Tiffany says, who was working with a producer that was also working with Diddy’s Bad Boy Records at the time. “A couple months later I went to college on a full music scholarship and kind of honed the actual talent there.” Moníque attended Morgan State University and formed a girl group, who was signed to a label and dropped soon after. Tiffany gradually began realizing her strive for a solo career – “In the trio in college there would be times where creatively I couldn’t really execute [my ideas], I had to be a team player. I was like, ‘wow if I was a solo artist I could really knock this out’”. After being dropped by their label and seeing the darker side of the music industry, Moníque admits she was very discouraged, “for a brief moment I was so turned off by the music industry I didn’t want to do anything.” With a twist of fate, she took a job at a pharmaceutical company. It was here where she received the phone call saying she would become one of Beyoncé’s background vocalists. Tiffany has lived a very exciting life pre-solo career. She’s sang with the likes of Beyoncé, Christina Aguilera, Mariah Carey, Faith Evans, and more. Recently, she got the chance to meet President Obama. “My mouth dropped, I was like ‘oh my god, oh my god!’ He and First Lady Michelle Obama gave us all hugs and congratulated us, and I don’t think any of us could really soak it in at the time ‘cause we were all in shock!” On tour in Brazil, Korea, and Egypt, to list a few, was when it hit Tiffany – “It was just unreal. What you see on TV, what you dream about being, [I’m] living that right now.” The future seems just as bright for the new solo artist. She hopes to collaborate with Ne-Yo or Beyoncé, of course. “The exciting part of being a solo artist is that I’m finally at a place where I can express my own beliefs and thoughts and creativity through music”. Tiffany – you’ve got some PIPES! Use them for good, not evil. Jillboard loves you. For more Tiffany Moníque, visit www.tiffanymonique.com or check out her Facebook and Twitter pages. Her debut EP “Nemesis” is available on iTunes. I thought Beyonce was taking a break from music? Guess not. I love Beyonce though, glad to hear more from her. I really like this song! Kanye is obvs a huge douche, but I used to love him before he basically kicked Taylor Swift in the face. He’s the cockiest mothersucker on the planet, which bothers me to no end, but he still continues to prove himself as a good musician. Is he the talent of the generation? No. The Spice Girls were. Anyway, check out this great hip-hop/pop/R&B diddy. Also, at the end Kanye says “Imma letchu finish but I got Beyonce on the track” – HAHA! I love people who can laugh at themselves. This makes him ever-so-slightly less of an awful person. I’M IN LOVE. Scale of 1-10 how creepy is it that I got butterflies the first time I heard this song? A friend of mine told me about Djs From Mars and I’m SO happy I checked them out. This instrumental is AMAZING! The change up from verse to chorus is unbelievable, I love what they did with this song. I honestly was shocked upon hearing this because I thought “Single Ladies” was untouchable – I was sorely mistaken. Go Djs From Mars!